After 26 days walking through Andalucia I had belatedly started to work out just how long the E4 was. The euphoria which had driven me along for the first few weeks was starting to drain away and I was looking for smaller tangible milestones to sustain me. One step at a time didn't quite cut it but ticking off another Spanish province would help and fortunately Murcia was a small one. Less fashionable as a walking destination than Andalucia, Murcia still looked interesting. Arguably it has an even stronger historical legacy. It was an important part of the Carthagenian empire (Categena on the coast is still a major port), a wealthy part of the Roman empire and for a time an independent taifi (kingdom) within the Arab world. The northern part of Murcia, where the E4/G7 route crosses the region, contains a number places of particular significance to Catholics with Caravaca de la Cruz designated as one of the five most important places in the catholic world. Unlike the GR7 in Andalucia there is no English language guide for the GR7 in Murcia so I was now relying on my own research efforts (something I would have to do for the rest of the E4). My key piece of information was a GPS route from Wikiloc published by a cyclist. As a matter of interest "Bornem", whose route I was to use for the rest of the GR7, has now completed the walk through Murcia and the route is now available via his website on Wikiloc. 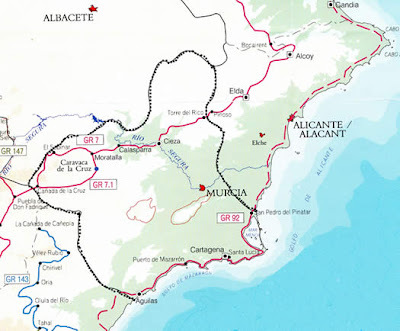 The route through Murcia is about 200 kilometres long. There is a variant to the GR7 which takes you to the south side of the Sierra de Moratalla mountain range to Caravaca de la Cruz, I stuck with the main route. The first challenge was to get to Canada de la Cruz, until I got there I didn't have a GPS route. The route is not clear and a large hunting estate just outside Puebla de Don Fadrique acts as a barrier. Essentially went cross country (which involved climbing over fences) and, without the aid of a route, got horribly lost. As often happened my luck eventually turned and signs suddenly reappeared just a few miles from the village. Shame about the route way marking because it's nice countryside. There is some casa rurale accommodation at Canada de la Cruz but it not available when I was there and the cheapest option was a return taxi trip to Puebla de Don Fadrique. Next day to El Sabinar was excellent. 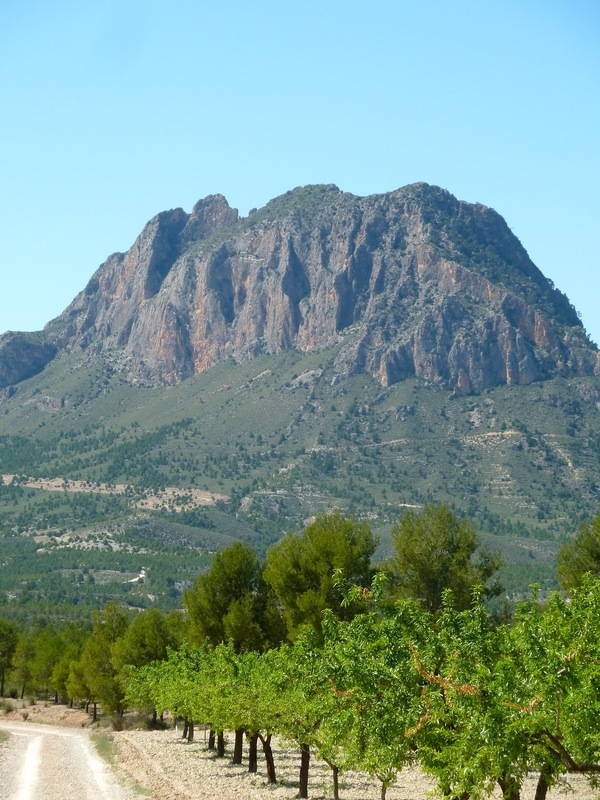 The route takes you up and then along a valley between the Sierra de Taibilla to the north and the Sierra de Mortella to south, dropping into a gorge lined with rocks in stunning colours and then into wild windy upland plain - huge views. I think there is a pension in El Sabinar, a tiny village, but I stayed just down the road in the wonderful boutique hotel at Casa Pernias. The walk to Moratalla was another good one. Starting in the high level plain from yesterday, you go past a huge reservoir near the small village at la Risca then dive down another dramatic gorge, with more colourful cliffs, with the Rio Alharaba at the bottom. When I went through it new growth on the pine trees gave everything a clean fresh look. Moratalla is an interesting town, a bit shabby, but with a lovely historic centre. There is a hotel on the outskirts but I chose to stay in a cheap and cheerful town centre pension. Another short easy day mainly across an agricultural plain to the lovely town of Calasparra. Calasparra is the home of a particular type of paella rice and the town has its own rice trail and museum. Compared to Moratalla it had a prosperous feel but with a similar historic centre. I stayed in the Hospederia Rural Constiticion, excellent and right in the middle of town. Next day's walk is excellent taking you along an east west ridge with wide plains to the north and south. To the north runs the Segura river which I guess provides the water for the rice which makes the area famous. You never get to climb to top of the ridge but contour along its side. Half way along you cross the dam holding the water back at the Alfonso X111 reservoir before going around the Sierra del Almarchion the shape of which is particularly dramatic. The Segura river flows around the ancient town of Cieza which surprisingly doesn't have any accommodation. I stayed at La Linda Tapada which was lovely but a bit a trek out of town - the owner will pick you up on request. There is no accommodation on the next stretch of the walk and it's not that pleasant either. A long stretch through the industrial suburbs to the north of Cieza, then through some dry scrub land and then huge fruit tree estates before hitting the motorway at Venta Roman. I got a lift back to La Linda Tapada and staying there two nights. The last day in Murcia is a bit better, the trail is good following an ancient camino across wide open and empty spaces and if you like big skies it's a nice walk. 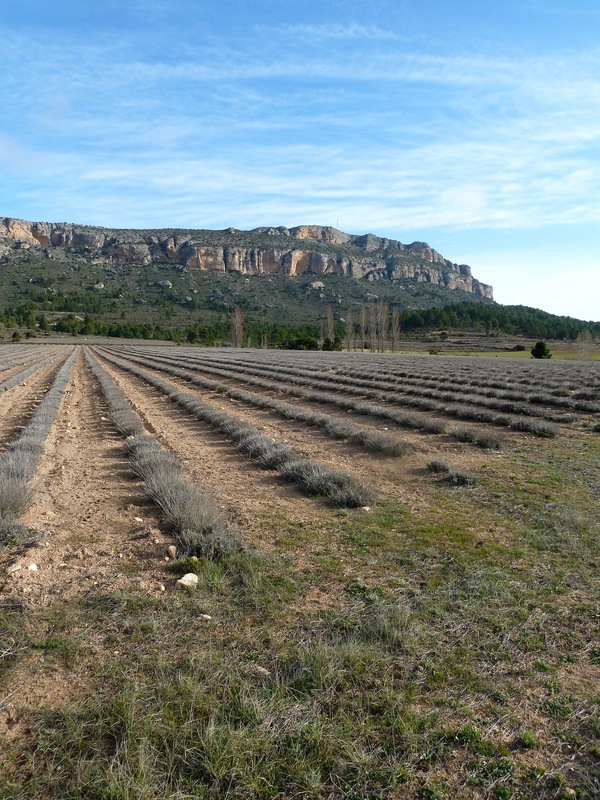 You cross the boundary into the region of Valencia just before you get to Pinosa, a small village with a big expat population and which has been speculatively over developed. Hi John - thoroughly enjoyed your account but thought I should let you know the link to "El Sabinar to Moratalla" is broken. Thanks Dave - glad you liked it. Fixed the link.